Tell me who your friends are and I’ll tell you who you are, is the aphorism you all remember. But what about social media? Though these might be the people you rarely contact or add them to your friends in order to ask them for some favor when needed, your contacts are still the people you surround yourself with on a social network. Let’s look through the friends list of Chris Montionless to find out a bit more about him. 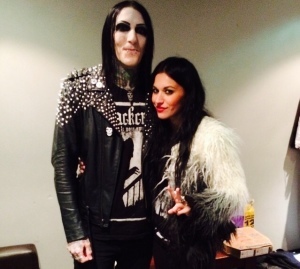 Chris Motionless with Lacuna Coil’s singer Cristina Scabbia. 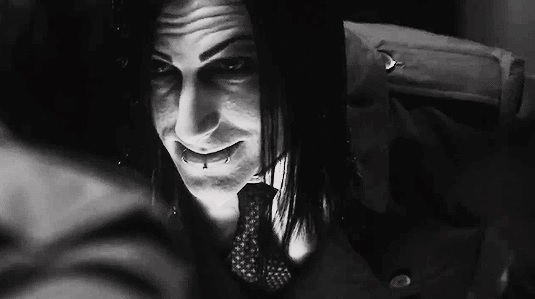 The frontman of Motionless In White seems to be a very sociable type: he follows 196 people on Twitter, most of whom are rock musicians or are related to music in some way. Among alt-rock artists he keeps in touch with, you’ll find the frontman of Dope, Edsel Dope, the leader of Issues, Tyler Carter, and William Control, ex-singer and founder of Aiden and now an independent label owner. The list goes on with Chris’s rock friends who Motionless In White toured with. Among them are Austin Carlile from Of Mice & Men, the singer of The Ghost Inside, Jonathan Vigil, the lead guitarist for Machine Head, Phil Demmel, and bassist for Blessthefall, Jared Warth. Not to forget Lacuna Coil’s gorgeous singer Cristina Scabbia. Chris seems to be more into modern bands and you won’t find any legendary 80-ies’ rockers in his list, with one exception – Dee Snider of revolutionary band Twisted Sister. 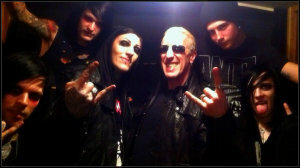 Motionless in White worked with Dee, when he starred in the band’s video for ‘Immaculate Misconception’. Dee even said Motionless in White remind him of Twisted Sister because of their powerful, in-your-face shows. To name a few Chris’s interests outside the world of rock, the singer follows some tattoo artists (not surprising), and he’s a fan of The Tampa Bay Lightning, an ice hockey team based in Tampa, Florida (he’s got almost a dozen TBL contacts). Now that’s an unusual twist. Chris recently started following… The Cheesecake Factory… Does it mean he has a weakness for cheesecakes? 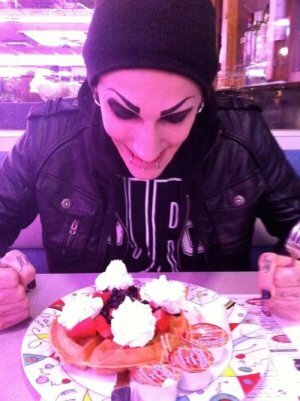 Well, we’ve heard about his passion for waffles (the photo got viral)… Share your thoughts in the comments, and join Alterock Facebook and Twitter to stay tuned for rock and metal news.